Are you desperate to improve the smell of your breath or just generally want to brush up on your oral hygiene? Does your dentist constantly nag about the importance of flossing? Or maybe you feel you are not seeing any benefits from string flossing. Well, maybe it is time that you consider switching to a Water Flosser. 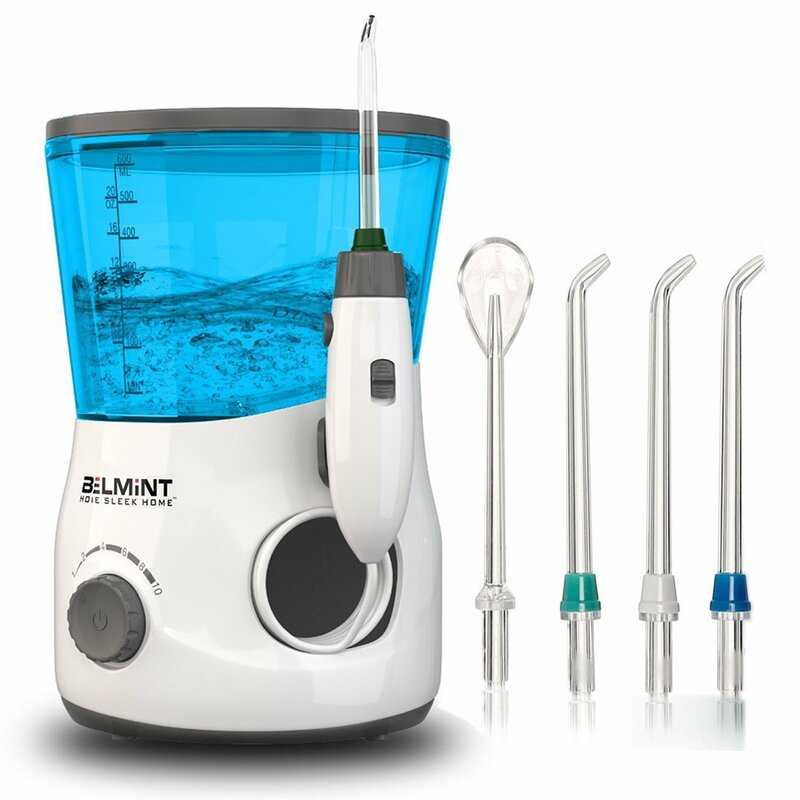 Gadgets like the Professional-Grade Countertop Water Flosser from Belmint are there to make your life a lot easier when it comes to removing that last bit of food that’s lodged between your teeth and it helps to reduce gum disease, gingivitis and plaque. They are also known as oral irrigators and use a high-pressure stream of water to clean in between your teeth as well as your gumline. They reach areas where your toothbrush and string floss can’t, like at the back of your mouth, and also massages the gums, which makes them stronger and healthier. In addition, the pressure from the flosser is so strong that once the water reaches your teeth it is powerful enough to remove the plague. And believe it or not, they also make your teeth whiter, and if you add a bit of mouthwash to the water, then you it will also give your breath a fresh smell. It is highly recommended for people with braces, dental implants, bridges, braces and crowns. What’s Special About The Professional-Grade Countertop Water Flosser? It is one of the leading Water Flossers out there with a nozzle that rotates 360 degrees, making it possible to reach those spots that you thought was impossible to get to. The Belmint water flosser has 10 water pressure levels so you can decide if the water pulse is too much for your gums or needs to go up a level or two to get to the good (or bad if you like) parts at the back. As soon as you turn on the Professional Grade Flosser, an auto-timer is activated and a beep alert goes off every 30 seconds over two minutes so that you don’t forget to switch to a different quadrant in your mouth. Compared with other products, it is quite a small and light device, but the tank holds more than enough water to get through the whole process. Due to it being so small, it can feel lightweight and plasticky, which really forces you to grip it firmly if you don’t want it to slip out of your hand. The magnet that holds the handle is not the best and has a tendency to fall off if you are not careful. Oh yes and like most oral irrigators, this one is also noisy and obviously it is not portable and you can only use them if you are near socket. It is attached to a water tank and it only starts working once the water streams through the cord and then sprays onto your teeth. It comes standard with the Professional-Grade Countertop Water Flosser, three inter changeable nozzles (color-coded for different users), one tongue scraper, a power cord and one hard shell case. You can also buy an orthodontic tip (good for braces) and pocket tip nozzles separately. Ultimately when you are off to buy a Water Flosser it comes down to your personal needs. If you want a flosser that you can take with you wherever you go, then you are better off getting a cordless one or a product that is operated by batteries. The Professional-Grade Countertop Water Flosser is bulkier as it sits on your bathroom basin and is powered by electricity, which means the stream of water is a lot more powerful and will remove more debris from your teeth a little easier than something that is operated by a battery. You also need to consider if you want something with adjustable pressures as kids’ gums can’t always handle the heavier streams while some adults can also have sensitive gums. Also, if it is your first Water Flosser, don’t forget to make sure you check out the warranties and guarantees as hiccups are bound to happen when you try something for the first time.